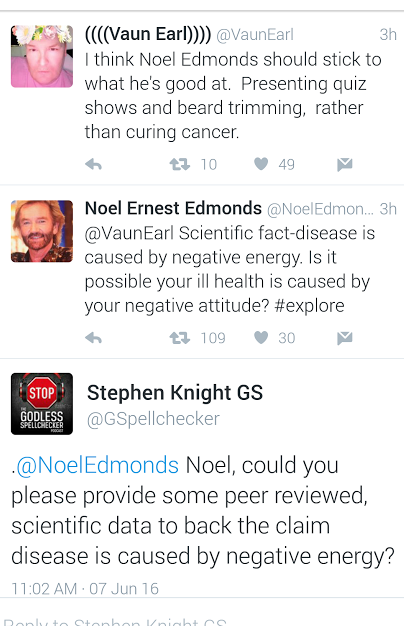 UK TV presenter Noel Edmonds continues to make headlines for all the wrong reasons this week after publicly asking a man to consider whether his cancer was the result of his own ‘negative attitude’. So, what on earth was all that about then? Edmonds has been publicly endorsing and promoting the ‘benefits’ of a product called the ‘EMP Pad’ on his official Twitter account and website. 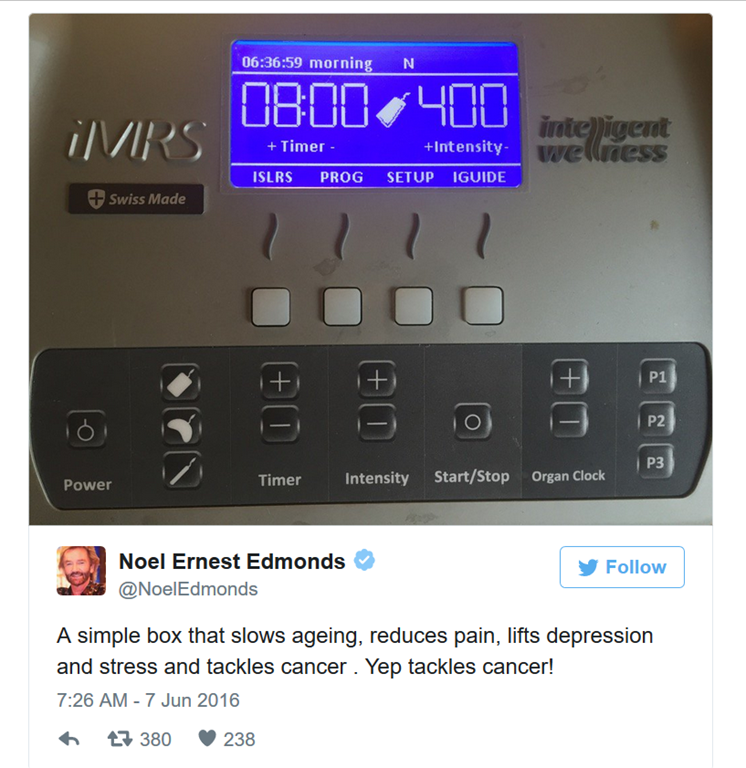 It is here Noel also made the troubling claim that the device is able to ‘tackle cancer’. I’m ILL with Kidney Cancer and lymph node metastases and psoriatic arthritis. Not working due to the above. @VaunEarl has since locked his Twitter account from public view. The EMPpad Omnium1 and EMPpad iMRS use very low intensity and frequency pulsed electromagnetic fields (PEMF) which target the cells within the body and help to improve the way they function. Research has demonstrated that this can lead to widespread health benefits, including supporting an effective immune response and a healthy overall body. Questions have also been asked about the nature of the relationship between Edmonds and the company behind the product. The claim that ‘negative energy’ can cause cancer has been rubbished by Oxford cancer researcher Dr David Grimes who said Edmonds’s comments were “not just untrue” but “patronising”. ITV’s Dr Singh said that ‘the vast majority of research (on electromagnetism) is poor quality and when it comes to cancer is even worse so I would be very careful taking things at first value when you are looking for that information’. Although research using very low frequency and intensity PEMF to help address cancer has produced some promising early results, it is currently in the very early stages and EMPpad does not make the claim that PEMF therapy can prevent cancer. The opinions of Mr Noel Edmonds are his alone and do not reflect in any way with the opinions of us at EMPpad. We had no discussion, input or prior knowledge of the content of Mr Edmond’s statement and we do not agree with it in any way, shape or form. We contacted the company, EMPpad following concerns about claims being made in a tweet by @NoelEdmonds for its EMPpad product. They were not aware of and didn’t have control of the tweet and as such it’s not an ad for the purposes of our rules. We will, however, be reviewing marketing claims on EMPpad’s own website to ensure they are sticking to the strict medical devices advertising rules that are in place. During this appearance, Edmonds revealed that he had previously been diagnosed with prostate cancer and stated that he was “absolutely certain” that the cause of it was “stress” because “stress is negative energy”. Noel also puts his now being free of prostate cancer down to “pulsed electromagnetism”, yet concedes you must also do “other things” too. It would be interesting to find out whether those “other things” also include proven, conventional medical treatment. And if so, how can he be sure the EMP Pad had any effect on his cancer at all? This is not “scientific” regardless of how many times Noel repeats the word. The tragedy here of course is that someone with a public profile like Noel’s has a reach, and more importantly – influence. What are the chances someone who is desperate and vulnerable may turn to Noel’s ‘miracle pad’ in favour of conventional, proven treatments? Despite the overwhelmingly negative reaction this whole episode has had for Noel, I would be willing to wager the EMP Pad has seen an increase in sales as a result. Noel is not a medical professional of course. The claim of a link between stress and cancer is at best weak, and at worst, grossly irresponsible. These kind of uninformed declarations come from a place of ego. You can see it in the above clip when Noel talks of having to make a decision about whether choosing to live or die – as though it was entirely in his own hands. As though it’s entirely a choice as to whether your cells finally succumb to the worst outcome of cancer. In truth, we’re all playing the lottery of lifestyle, circumstance and genes. Well, everyone except Noel Edmonds of course. He’s got a magic mat. Studies have claimed that ‘half of the UK’ population will be diagnosed with cancer at some point in their lifetime. The best people to provide you with a fighting chance and credible information are qualified medical professionals. Not TV hosts and snake oil salesman. If you’re of an age that is considered high risk or have a history of cancer in your family – make sure you get regular check-ups. 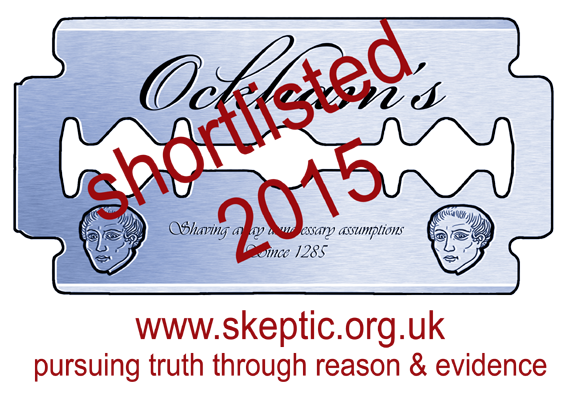 Even if Edmonds does believe in it – this sort of thing prevents people getting real treatment. People aren’t always saved by treatment because cancer is one of the more complex and knotty disease problems but offering people false hope with a fake treatment is in my view wicked. There’s just far too much of this sort of crap preying on desperate people with long term illness – and its very lucrative also. Precisely because it can’t be “proved” it appeals to many and even more when people are in extremis. People die because of this sort of thing, and I know some who’ve been affected by it and it makes me pretty angry. This is the stupidest thing Noel Edmonds has done since he beheaded Clive Anderson.